What do you do when your nation’s flag is too similar to the country right next door? When other countries confuse your nation’s flag with the other? Or when over half the population no longer thinks that it is relevant to them or represents the diversity of people living there? These are the questions that Kiwis from New Zealand have been debating and will possibly be voting on later this year. Can you identify which of these flags belongs to which country? In case you couldn’t spot the subtle differences between the Australia flag (on the right) and New Zealand’s flag (on the left), you’re not alone—even officials in Canada displayed the wrong flag throughout Ottawa when Australian Prime Minister Bob Hawke visited in 1985. The problem with Australia and New Zealand’s flags, aside from differentiating the two fierce rivals, is that they both use the Southern Cross constellation of stars on blue. From a perception and nationalistic point of view, many in New Zealand feel that their national flag doesn’t truly represent their culture or values; especially the qualities of the indigenous Maori people. The similarities between Australia and New Zealand’s flags are not an isolated issue. Several former British colonies, now part of the Commonwealth of Nations, face the same dilemma in that it is hard to distinguish one from another just by viewing their flags. This “branding” problem stems from the days of the former British Empire—when flags based on naval insignia and colors were used to identify the territories administered by the English crown. All of these flags incorporated the Union Jack (United Kingdom flag) displayed on a red, blue, or white field. A corresponding crest, pattern or other graphic device was then used to signify individual colonies. 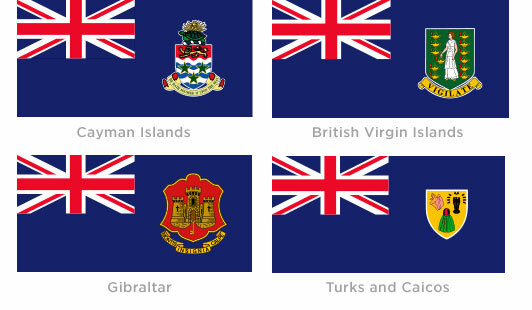 Many of these nations are still part of the Commonwealth of Nations, and use the same flags from Imperial times to distinguish their national identity. The debate that is currently raging regarding changing New Zealand’s flag is how best to represent the country’s diversity, character, and values. 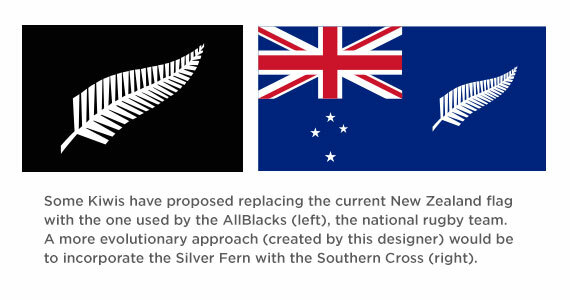 Ideas for a new flag include changing the flag to that of the country’s beloved All Blacks rugby team: a black flag with a silver fern. Such a drastic change would be similar to the one that Canada went through in 1965, when it changed from its Imperial-rooted flag to the now ubiquitous and beloved Maple Leaf. While the debate over the Kiwi flag is far from over (a recent vote in their parliament tabled the conversation for now), it is very likely that a new flag will be designed and flown soon. Branding New Zealand by adopting a new flag will help build perception and relevance in the eyes of its people, as well as differentiate them from the Aussies next door.